disastrous relationship with Basim Sabri. As the year comes to a close, let’s give a second viewing to a story that fell through the cracks. The Channel 79 production of the September 30, 2014 Z&P Committee hearing only has 90-some views (it was a limited release). Still, it made an impression. Imagine it as a movie where a swarthily corrupt developer (a composite character loosely based on Michael Lander and Basim Sabri; played by Alfred Molina) proposes to construct rental housing at 2320 Colfax with few amenities. 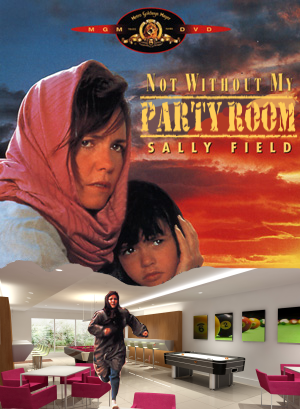 After a bunch of underwhelming speeches, it climaxes with William Wells (played by Sally Field) concealing MRRDC inside his burqa, and fleeing to the southern Wedge, where they find luxurious refuge and ample parking (in the party room at Flux). Here’s the script. Alright, maybe that metaphor doesn’t hold up. But listen, they really did appeal 2320 Colfax, in part, because it would have no party room, no gym, and no staff in the lobby. This from the crowd who’s not shy about shoehorning gentrification-based criticism into their arguments against all new development. I realize many gentrification complaints are made with a wink and a nod, and a healthy dose of the kitchen sink; but it’s still worth taking time to highlight the nonsense. This was the closing argument on the day history died at 2320. And then there was Anders Christensen’s delightfully obnoxious performance in the role he was born for. Some background on Anders for the uninitiated: he’s a former LHENA president (1979), house historian, real estate tycoon, house restorer, master of frivolous lawsuits, gofundme magnate, and Wedge walking tour guide. While he no longer lives in the Wedge, he loves our neighborhood’s old homes harder than ever. Those so-called “experts” who would declare any of our houses to be “not historic” will find themselves derided by Anders as silo-sucking fourth-ring-suburbanites. Perhaps most importantly, he is the spiritual leader of the notorious Facebook group/doomsday cult called The North Wedge Historians. Anders introduced himself to the committee as an advocate, not for houses, but for “low-income and vulnerable adults.” He then launched into a speech where he calls out the committee members as a bunch of heartless bastards for allowing the owner of the boarding house to sell his property, as this would displace the home’s current residents. I don’t know how it played in the room, but I was deeply moved watching at home on YouTube. What I found problematic was some inconsistency in the plot. The previous month, Anders and his organization, the Healy Project, presented LHENA with an alternative to the developer’s proposal. This alternative preserved the houses, while eliminating all the rooming-house-style units. The alternative plan contained not a hint of concern for the “vulnerable adults” (though they managed to squeeze in plenty of additional parking). Turns out, Anders was really in love with the houses the whole time! Oops, I forgot to say spoiler alert. Bottom line: despite the illogical plot twists and over-the-top sanctimony, I think it’s worth a rental, or at least a quick YouTube scroll-through.